Inspiration Behind The Book - LAUNCH OUT INTO THE DEEP! Inspiration Behind Launch Out Into The Deep! Normally, when a person writes a book, the first question asked of them might be, "So, what inspired you to write this book?” If you asked me that question my answer would be that it was totally God. Yes, I know that most Christian authors make the same statement. In this case, I literally mean that it was God's plan and not my own. I was employed at Inner Harbor hospital in Douglasville, GA as an adolescent counselor. This job confirmed to me what I always believed which is that I have the gift of counsel and a desire to help others. One day, I was telling my co-worker about the dream I had of being isolated and feeling alone in the middle of a dark sea (Note: this dream is described in the first newsletter that was sent out). I went on to describe how I had journeyed so far in the sea and came half way to the finish mark and stopped. At this time in my life, I had grown faint hearted and weary in my faith. This dream depicted how I really felt. I was on the verge of giving up and believing that good things happen to others but nothing special or miraculous would happen in my life. Besides, where was God in the middle of all that I was going through? Within the dream, God opened my spiritual eyes. There were angels on my right side, left side, and one that was standing behind me; the angel standing behind me had its arms under my arm pits and was holding me up, as I no longer had the strength to stand. My co-worker was in awe and said, "Acacia, the way you described that was so vivid I can see the scene before me." She went on to say, "Whether you know it or not you're a writer!" Her words confirmed the words a college friend articulated after I shared some personal experiences. Her exacts words were, "If you leave this earth and don't share your story, it really would be tragic." Shortly thereafter, I was inspired to write poetry from the youth I worked with. All three poems, “Fear Not Only Believe,” “Stand” and “Keep Hope Alive,” are featured in the Launch Out Into The Deep devotional. To be honest, I'm just not a poet. I wrote the beginning and middle part of each poem and became stuck because I just could not keep the rhyme pattern. That's when mom suggested I ask Aaron to help. My brother looked at the poems and completed all three within moments of looking at them. I was inspired by Aaron's gift for words and encouraged him to write more. Within a month, he had composed over 20 poems effortlessly. I thought his work needed to be published as I believe his poems to be very inspiring. I took each poem and added a title, words of the wise, and a scripture verse. As I began to research, I discovered that poetry books are not particularly marketable. That’s when the idea for the devotion came into play. Not all, but most of the poems written by Aaron inspired many chapters of the book. I thought I'd add the first poem that inspired and began the journey of Launch Out Into The Deep. Fear not my child, for I am near. I will wipe away every tear. Be not ashamed, you are not alone. I am your sunshine in the midst of the storm. Step forth in faith – do not sway; the help you need is on the way. for the Lord Jehovah is nearby. the Lord comes just in time to save the day. but He’s the Lord Almighty, He knows what to do. He wants to make sure you’re ready that’s the reason. your path through the storm to your destiny. 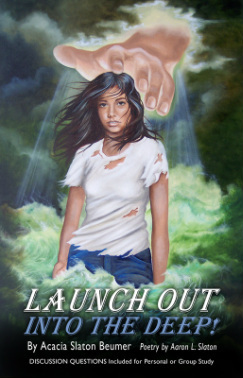 Join our mailing list today and receive Two FREE chapters from Launch Out Into The Deep, and a screen saver version of the powerful vision behind the book. We will keep you updated on the release of the revised version of Launch Out Into The Deep and also send you our newsletter filled with inspirational quotes, poems and relevant topics for today.